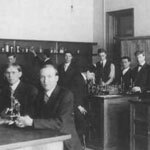 1905-1906: Two year medical courses began in the Department of Biology with 14 students. 1912: Medical program established as a separate two-year Medical School that became a member of the American Association of Medical Schools (AAMC) and the American Medical Association (AMA) Council of Medical Education. 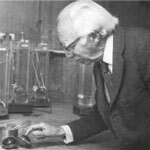 1916: School of Pharmacy established. 1924: Premedical requirements increased to three years of college. 1935: Medical School Alumni Association organized. 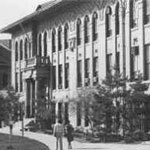 1942: From 1906 until 1942, the two-year medical program graduated 548 students who transferred out of state to four-year medical schools to complete their requirements for a medical degree. 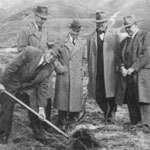 1942: University of Utah Board of Regents approved a four-year medical school in May. 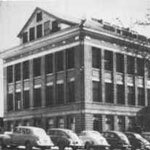 1942: Agreement with Salt lake County to use county hospital on 21st South and State Street for teaching in exchange for care of county patients at no cost to the county. 1942: Medical students were accepted for their third year. 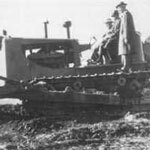 1942-1945: First wave of new full-time faculty joined the medial school to create new academic departments and strengthen existing departments. 1943: Clinical appointments of practicing physicians to serve as teachers. 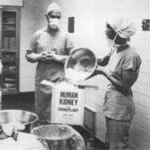 1944: Residency training program in Medicine started. 1944: The four-year medical school was officially accredited on June 12. 1944: The first class of the four-year school graduated Sept. 10. Four women were among the 35 graduates. 1945: First research grant of $100,000 provided by the U.S. Public Health Service to the medical school to study genetic diseases. This was the first grant awarded to any medical school through this organization and was renewed annually for 33 years, bringing nearly $10 million to Utah. 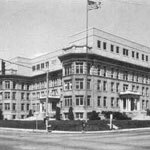 1946: Affiliation with the Veterans Administration Hospital for teaching medical students and residents. 1948: Medical School awarded $416,400 grant from the National Institutes of Health to study cancer. 1949: Utah began accepting medical students from other Intermountain states. 1951: Cancer research building opened on campus, the first building on the health sciences campus. 1955: U.S. Public Health Services awarded the medical school $1.5 million for research. 1955: Business Bureau reported for every dollar invested in the medical school by Utah, three dollars were generated for the economy. By 2005 for every dollar provided by the state, nine dollars were generated. 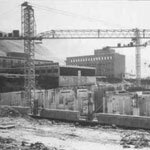 1956: The University Board of Regents unanimously approved construction of a $10 million medical center. 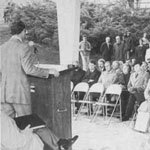 1959: Division of Postgraduate Medical Education established. 1960: Reported 126 full-time and 325 clinical faculty members. 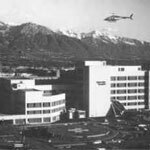 1963: Clinical Research Center (CRC) funded by NIH was established at the Salt Lake County Hospital. 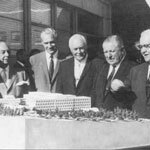 The CRC was moved to University Hospital when it opened in July 1965. 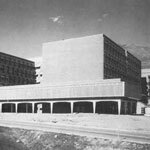 1965: The University of Utah Medical Center opens its doors on July 10. The new 220-bed Medical Center costs $15.6 million. 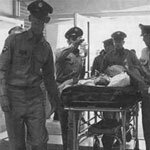 1968: A Four-bed Newborn Intensive Care Unit opens--the first in the Intermountain West. 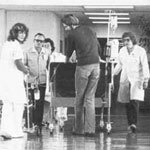 1976: University Hospital opens the Intermountain Burn Center. 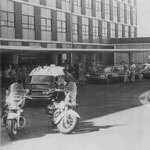 1978: University Hospital begins Air Medical Transport Service. 1980: Teen Mother and Child Program established. 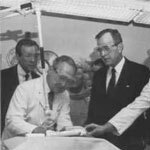 1981: New $43 million University of Utah Hospital opens on Sept. 22. 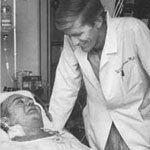 1982: World's first artificial heart implant performed on Barney Clark. More than 300 media representatives flock to University Hospital. 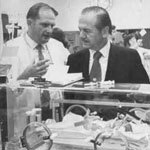 1982: University Hospital opens pediatric intensive care unit. 1983: University begins in-vitro fertilization program. 1985: 16-year-old Tony Shepard receives the first heart transplant in the state of Utah. 1985: University Hospital installs area's first magnetic resonance imaging (MRI) scanner. 1991: Travel Clinic opens at University Hospital. 1991: Bone Marrow Transplant Program begins on remodeled fifth floor of University Hospital. 1993: John A. Moran Eye Center opens. 1995: Red Butte Clinic and Park City Family Health Center open, expanding community clinics, which include Wendover, Holladay, and Wasatch Clinics. 1996: Utah's first double-lung transplant performed at University Hospital. 1996: Utah's first telemedicine connection links University Hospital and Wendover patients. 1997: Telepharmacy offers hospital pharmacy and drugs to health centers throughout the state. 1998: University Hospital issues patient record No. 1,000,000. 1998: University Hospitals & Clinics purchases five outpatient medical clinics, creating a 14-clinic network along the Wasatch-front and in Summit County. 1999: University Hospital's Intermountain Burn Center earns prestigious national accreditation. 1999: The 225,000 square-foot Huntsman Cancer Institute opens. 2001: University Hospital is named the Intermountain West's first nationally verified Level I trauma center by American College of Surgeons. 2001: Three University Hospital nurses go to NYC to aid burn patients after terror attacks. 2001: Utah Diabetes Center opens in Research Park. 2002: University Hospitals & Clinics provides medical care for the Winter Olympics' athletes village, and for the opening and closing ceremonies. 2003: University Hospital opens $42.5 million George S. and Dolores Doré Eccles Critical Care Pavilion. 2003: University Hospitals & Clinics opens Spanish-speaking clinic at Redwood Health Center. 2004: University Hospitals & Clinics opens the South Jordan Health Center. 2004: University Hospital opens the Comprehensive Transplant Services and Specialty Clinic. 2004: The 50-bed Huntsman Cancer Hospital dedicated. 2004: University Hospital opens the University Orthopaedic Center in Research Park. 2005: University Hospital's Stroke Services named region's first primary stroke center. 2005: University Hospitals & Clinics celebrates 40th anniversary. 2005: $40 million Spencer F. and Cleone P. Eccles Health Sciences Education Building opens. 2005: Opening of the 125,000-square-foot Emma Eccles Jones Medical Research Building. 2005: University of Utah Health Care launches liver transplant program. 2005: University of Utah School of Medicine celebrates "A Century of Brilliance," the 100th anniversary. 2005: An Alzheimer's program for the 21st Century: the center for Alzheimer's care, imaging, and research opens. 2006: The new $54 million John A. Moran Eye Center opens. 2006: University of Utah Health Care opens the Centerville Health Center. 2006: University of Utah Health Care launches the Pancreas Transplant Program. 2006: The Sports Medicine & Research Testing Laboratory in Utah is accredited by the World Anti-Doping Agency. 2006: AirMed voted the 2006 International Program of the Year. 2007: University of Utah Health Care celebrates the completion of Eccles Critical Care Pavilion expansion. 2007: University of Utah Health Care debuts fastest scanner in the region, a new CT scanner that captures three-dimensional imaging of the heart in a single beat. 2007: Mario R. Capecchi, a University of Utah gene-targeting pioneer, wins the 2007 Nobel Prize for Physiology or Medicine. 2007: AirMed voted International Program of the Year by The Association of Air Medical Services, which represents nearly 500 medical transport programs worldwide. 2008: The Clinical Neurosciences Center opens. 2008: Groundbreaking for the expansion of the Huntsman Cancer Hospital. 2008: University awarded a $22.5 million Clinical and Translational Science Award (CTSA) from the NIH to speed the time it takes for research to be put into clinical use. 2009: The Clinical Neurosciences Center receives designation as a Neuroscience Center of Excellence (COE). 2009: University of Utah Health Care opens the first integrated electrophysiology (EP) MRI laboratory in North America. 2009: The Health and Wellness Center opens. 2009: University of Utah Hospital opens $200 million Patient Care Pavilion. 2010: University of Utah Health Care achieved the No. 1 ranking in University HealthSystem Consortium’s 2010 Quality and Accountability Study. 2011: University of Utah heart surgeons have transplanted nearly 250 artificial hearts (ventricular assist devices) since 1996, with 155 of these in the last 3 years. 2011: The U’s AirMed flight program, the state’s only air emergency service that offers obstetrics care, celebrated its first in-flight birth. 2011: The Hospital at Huntsman Cancer Institute opened an expanded wing featuring four new operating suites, 50 additional inpatient beds, and an MRI on rails that allows for real-time imaging of brain cancer patients during surgery. 2011: The University Neuropsychiatric Institute (UNI) expanded to include more than 80 new inpatient beds, filling a critical need in the community for more mental health services. 2011: University Hospital opened the country’s only Faint and Fall Clinic. Doctors in cardiology, neurology and geriatrics work together to find answers to fainting and falling problems in patients, which account for a large number of emergency room visits and high health care costs. 2012: The South Jordan Health Center, the U’s newest multispecialty center, opened in January. It features primary care, specialty care, and a 24-hour emergency room.